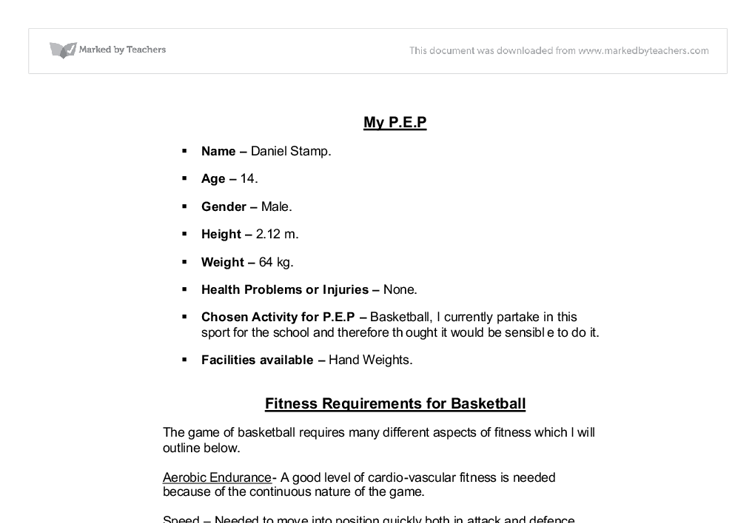 Chosen Activity for P.E.P - Basketball, I currently partake in this sport for the school and therefore thought it would be sensible to do it. Facilities available - Hand Weights. My P.E.P * Name - Daniel Stamp. * Age - 14. * Gender - Male. * Height - 2.12 m. * Weight - 64 kg. * Health Problems or Injuries - None. * Chosen Activity for P.E.P - Basketball, I currently partake in this sport for the school and therefore thought it would be sensible to do it. * Facilities available - Hand Weights. 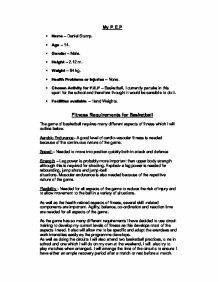 Fitness Requirements for Basketball The game of basketball requires many different aspects of fitness which I will outline below. Aerobic Endurance- A good level of cardio-vascular fitness is needed because of the continuous nature of the game. Speed - Needed to move into position quickly both in attack and defence Strength - Leg power is probably more important than upper body strength although this is required for shooting. Explosive leg power is needed for rebounding, jump shots and jump-ball situations. Muscular endurance is also needed because of the repetitive nature of the game. Flexibility - Needed for all aspects of the game to reduce the risk of injury and to allow movement to the ball in a variety of situations. As well as the health related aspects of fitness, several skill-related components are important. Agility, balance, co-ordination and reaction time are needed for all aspects of the game. As the game has so many different requirements I have decided to use circuit training to develop my current levels of fitness as this develops most of the aspects I need. ...read more. Personal Exercise Plan Training Session: Number Four Type of Training: Circuit Session Outline (including intensities & recovery) * 3 circuits of 10 stations * 25 seconds work per station with 25 seconds recovery between stations * 50 seconds slow jogging recovery between each circuit #1 Press ups #2 Bench jumps #3 Scrunch sit-ups #4 Leg Changes #5 Triceps dips off the bench #6 Squat jumps #7 Sit-ups #8 Modified pull-ups off the beam #9 Step-ups #10 Shuttle runs Evaluation of session I felt the circuits definitely overloaded me, but I felt more comfortable than last week on several stations, including the press-ups and squat jumps. I think it was the correct decision to maintain the levels of intensity & would benefit from a repeat session next time. I coped quite well with the recovery between the circuits, but the reduction in time made a difference. My flexibility also seems to be improving, but my other training at the basketball club is helping with this aspect as well. Considerations for next session maintain this level of intensity next session. I need to allow more time to cool-down, especially for the mobility exercises, as the extra training is making me slightly stiffer for my other activities and this may help me warm-up easier for those. Personal Exercise Plan Training Session: Number Five Type of Training: Circuit Session Outline (including intensities & recovery) ...read more. I now understand how to implement gradual changes to the intensity without risking injury and fatigue. I also have a better understanding of the need for adequate recovery time and the importance of a proper cool down period. Before following this PEP is used to only spend time warming up. The exercises were followed safely and the quick safety check of equipment was carried out each session. The retest results how I have improved in all areas of fitness. I was particularly pleased with the vertical jump and flexibility results. These improvements have allowed me to be more effective in the matches I am playing and I am starting to make fewer mistakes in my passing and shooting skills. I also seem to be more effective under the basket when rebounding. However I still feel I need to develop my upper body strength. I found the evaluation of each session useful and will continue to do this in the future, not only for training but matches to make my goal setting more effective. The PEP helped my levels of motivation as I wanted to constantly strive for improvement as well as my levels of concentration. Because I was getting tired I found I had to focus on the technique and I have started to transfer this to the game situation which has helped my skill performance. I will continue to incorporate circuit training into my overall programme and aim to gradually increase the work intensity, after reducing the recovery time between the circuits. ...read more. This student written piece of work is one of many that can be found in our GCSE Exercise and Training section. Heart rate taken at 1 minute intervals post exercise in bpm Minutes 1 2 3 4 5 6 7 Heart rate 132 120 108 98 82 76 64 Multi-Stage Fitness Test My resting heart rate taken before the test was 62 beats per minute. Training Programme. The following is what I did in the fitness suite for five weeks. As I went in three times I week I completed the same work out in the same week. As I went in to the next week I then pushed my self harder. This will allow me to build up to the competition in December. I have produced a template to show the phases of Periodisation and this can be found on the next page. The only other commitment I have is rugby. Second service in doubles has also been scrapped and best-of-three-set matches will be won by the first to 21 points, instead of 15 for men and 11 for women. Service action The shuttlecock must be hit below the server's waist and the racket head must stay below the server's wrist, which means the shot must be played underarm. Agility is an important component in hill walking especially while climbing or walking down very steep slopes; poor agility and inability to keep the body under control during changes of position can too result in severe falls and accidents. Co-ordination Co-ordination is a key element in hill walking. Resting pulse rates very but normally between 60-80 b.p.m. A person who exercises regularly may have a resting pulse of 50-60 b.p.m. If we exercise regularly we will see a significant decrease in the heart rate. We can also see that the heart of a fit person will beat far fewer times, therefore it will be much more efficient causing less stress to be put on the heart.